Because vultures they rely on sight to locate their food, they prefer open, arid land instead of forested areas. 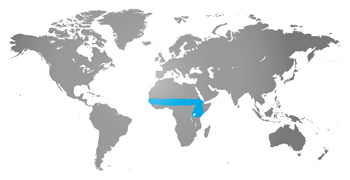 They live primarily in the high cliffs of central African countries, including Ethiopia, the Sudan, Tanzania and Guinea. Vultures are scavengers, which means they often eat animals who have died from old age, disease, or were still-born. As scavengers, vultures perform a crucial role in the ecosystem by getting rid of dead animals. Vultures can eat rotting flesh that contains anthrax, botulism, and cholera bacteria with no ill effects because acids in the vulture’s stomach destroy these organisms. At the Zoo, the vultures eat a bird of prey diet, plus rats and small bones. Vultures’ bodies are mottled brown or black with a whitish-brown underbelly and thin white fluff covering the head and neck. Vultures have long necks and small heads which allow them to dig deep inside animal carcasses. Also, their featherless heads allow them to dig deep into an animal’s body cavity without getting too messy. Ruppell’s griffon vultures roost, nest, and gather to feed in large flocks. They make large nests of sticks lined with grass and leaves. Ruppell’s griffon vultures pair up for life. Both parents share in incubating, brooding (sitting on the eggs), and feeding the chicks. A single egg is laid each year, and the young bird is ready to fly in 12 weeks.